In addition to traditional Low Temperature Cook & Hold units, FWE offers several models of Low Temperature Cook & Hold Smoker Ovens. LCH units work with little or no air movement, creating a gentle, uniform heat that surrounds the product to cook and hold it at a safe temperature. FWE Smoker Ovens utilize this same slow cooking technology to produce high yield natural browning, no browning agents or processes, like pre/post searing needed. FWE Smoker Ovens can be used with almost any type or grade of meat when slow cooking. The delicate flavor of salmon and other fish favorites will be preserved and enhanced; vegetables retain their rich color and nutrition, and breads, rolls, desserts, apple pie and cookies brown evenly for a golden presentation. Naturally browning & reduced shrinkage: FWE Low Temperature Cook & Hold Smoker Ovens combine radiant and gentle convection heat, allowing meats to brown naturally. Since more juices are retained during the cooking process, product shrinkage is greatly reduced - as little as 4%. High product yield: Fat is a contributor to flavor and is chemically altered during the smoking and cooking process. By using low heat in the cooking process, less fat reduction occurs, leading to a more flavorful product with higher retained moisture. Low temperature cooking allows natural enzymes to act as a tenderizing agent, producing less shrinkage as well as a longer product holding life. Drip Tray with Filter: An integrated and removable drip tray is installed with a tangent draw off for safely removing hot grease and drippings. The tray easily separates liquids and solids from the pan with a removable steel filter for ease of cleaning, located in tray corner for easy pouring. Kitchen Friendly Controls: Units come equipped with intuitive, easy to use and kitchen-friendly controls. Preset cooking profiles preserve your standardized recipes for better product consistency. FWE Smoker Ovens allow you to set up and store 8 different cooking and holding profiles. Smokers are also provided with an internal product probe, giving operators options: to cook and hold by probe or by time, both without constant monitoring. With the included meat probe, operators are able to set unit to cook to an internal core temperature, then automatically switching to hold mode for maximum product yield. The probe mounting bracket keeps the probe close at hand and therefore convenient to use. The smoker feature on the control panels allows you to set up different smoking, cooking, and holding options that switch automatically. The Smoker Drawer: Using wood chips, the built-in 'smoke drawer' allows up to 4 hours of smoking, the longest burn time in the industry without wood chip refill! The smoke feature is controllable in half-hour increments and runs independently of heating elements for the cavity, allowing for cold-smoking processes. The flush-mounted smoke drawer is easily accessible for safety and cleanliness - refill chips without removing food and allows for slower smolder and extended smoking times. Units shipping within the US will be provided with one sample bag of wood chips. Wood chips come bagged, food safe, clean and ready to use! 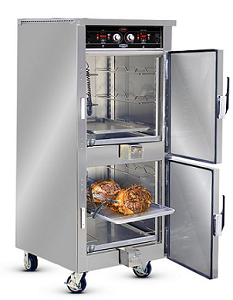 Multi-Purpose Equipment: When not being used for cooking, FWE Smoker Ovens can be used for holding prepared foods. When used for reheating or holding prepared foods, these ovens reduce drying, shrinkage and flavor loss. Since smoke elements run independently of heating elements, smoker ovens are able to cold smoke cheeses, fish and other products. Save money: Like other LCH models, smoker ovens typically require up to 50% less energy than a conventional oven. In many cases, smoker ovens are used overnight, and therefore utilize off-peak electric rates for even greater savings. Smoker ovens also enable users to buy less expensive cuts of meat, since holding cycles promote tenderization. Pre-soak wood chips: For best results, soak the wood chips overnight to prevent a bitter taste. Added moisture in the wood helps the smoke to distribute evenly throughout the cabinet. Soaking chips in port wine or beer can achieve subtle flavors that pair well with your seasoned foods. Mixing smoke woods: Mix together different wood types to crate your signature flavor. For Subtle smoke flavor: Foods that absorb more easily such as cheese or delicate fish should be smoked for 30 minutes. For Standard smoke flavor: One hour of smoking time is best suited for every day smoking of meats such as chicken, chicken breasts, turkey, more sturdy fish (such as Salmon) and many more foods! For Robust Smoke Flavor: Pulled pork, beef, lamb, and beef brisket are just a few of the choices to add your distinct smokey flavor recipes with two hours of smoking. FWE not only manufactures the highest caliber of Cook & Hold Smoker Ovens on the market today, we also offer a variety of accessories to improve production on your end. Accessories include: wood chips, rib rack, chicken spike, potato spike, bearclaws, extra meat probes, extra stainless shelves. To learn more about features and accessories, see literature, additional photos and get a quote, visit www.fwe.com/products/smokers. A more in-depth exploration of how low temperature cook and hold units work can be found at www.fwe.com/learn/An-Introduction-to-Cook-and-Hold-G2-Series. If you are interested in speaking to a sales representative about this product or other that FWE offers, please contact sales@fwe.com.